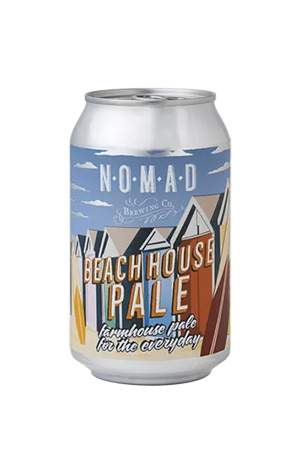 It’s worth knowing from the off that Nomad’s Beach House Pale isn’t exactly a pale ale – at least, not in the strict sense of the style guidelines. Sure it’s got a pale appearance but underneath it’s a real mishmash of styles, some kind of blend between a kettle sour, saison and something altogether hoppier. Then, being Nomad, they’ve added lemon myrtle and lemon zest, which confuses the matter further. So how does that all come together? In a most delightful way. It’s an unabashedly refreshing beer that’s made, if you didn’t get the implication from the name, for warm beach weather. It’s light and spritzy with a pleasant fruity tingling sensation reminiscent of sherbet. That’s helped on the flavour front by lemon and citrus character, stemming from the hops and native ingredients, which add up to an interesting, easy and pleasing beer.